Many of our clients confess confusion and worry as they admit they did not consider graffiti a crime, let alone criminal damage. The problem is that there are conflicting social views on this art form. Many do not consider it to be an art form at all and instead, associate graffiti with vandalism and gang culture. This makes people worry that when they see graffiti that it is the start of anti-social behaviour which could perpetuate into many community issues. This is where the law must enforce specific regulations to ensure all of society knows the legal stance on graffiti as a crime. 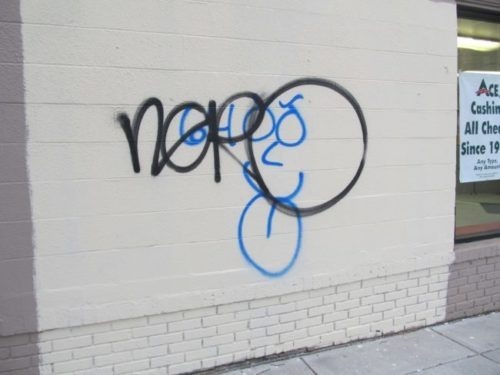 According to the Criminal Damages Act 1971, graffiti can warrant a fine of £5,000 for damage or potentially, the person carrying out the graffiti could receive a community service order for young offenders. Cases with damages exceeding £5,000 will be referred to the Crown Court. They can also receive a fixed penalty notice depending on the circumstances. If you, or in many cases your child, are faced with allegations of graffiti charges, it is important to seek legal advice as soon as possible. At Bloomsbury Law, we understand that there may be a lot of confusion around graffiti law, especially for the younger generation. We appreciate how important it is to keep your record clean if you are a first time offender. As such, we are here to make sure we do everything we can to provide you with the most satisfactory outcome possible. If you are seeking legal advice, please get in contact with one of our specialists. We will listen to your situation, answer any queries that you may have and advise you accordingly once we are instructed.